U.S. Secretary of State John Kerry walks down the stairs in the twilight after landing in Vienna, Oct. 22, 2015. U.S. Secretary of State John Kerry voiced a "cautious measure of optimism" that a solution can be found to defuse deadly Israeli-Palestinian violence. Following a four-hour meeting Thursday with Israeli Prime Minister Benjamin Netanyahu in Berlin, Kerry said some proposals may be put on the table in the coming days that will have an impact on stopping the unrest. He said he plans to raise the proposals with Palestinian President Mahmoud Abbas and Jordanian President King Abdullah during a meeting Saturday in Jordan's capital, Amman. Kerry also said it is time for the Israelis and Palestinians to move beyond "condemnations and rhetoric," and he urged both sides to take concrete steps to stop the violence, which has left at least eight Israelis and about 50 Palestinians dead. Israeli news reports say two Palestinians stabbed a Jewish man in Beit Shemesh, after initially trying to board a school bus. A Palestinian swings a sling during clashes with Israeli troops, near Ramallah, West Bank, Oct. 20, 2015. Kerry stopped short of assigning blame for the ongoing violence. He also did not address Netanyahu's controversial comments this week that a World War II-era Palestinian leader encouraged Adolf Hitler to exterminate European Jews. The top U.S. diplomat also met in Berlin Thursday with German Foreign Minister Frank-Walter Steinmeier and European Union foreign policy chief Federica Mogherini. 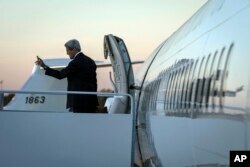 He later flew to Vienna for Syria-related meetings Friday with the foreign ministers of Russia, Turkey and Saudi Arabia. The violence, which erupted nearly a month ago, has stemmed mostly from Palestinians using knives, guns and vehicles to attack Israeli civilians and soldiers, followed by Israeli defense mechanisms and retaliation. On Wednesday, U.N. Secretary-General Ban Ki-moon said he was "not optimistic" after his talks with the Israeli and Palestinian leaders. 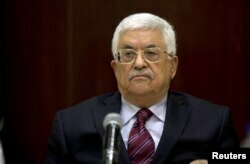 He urged both sides to pull back from the brink of what he says could erupt into a full-blown Palestinian uprising. Netanyahu has said Abbas and the Palestinian leadership must stop “lying” about Israel, specifically, rumors that Israel is planning to take over an East Jerusalem holy site revered by both Jews and Muslims. Israel says it has no intention to change the long-standing rules overseeing what Muslims call the al-Aqsa mosque or Noble Sanctuary, and Jews call the Temple Mount. Palestinian President Mahmoud Abbas chairs a Palestinian Liberation Organization (PLO) executive committee meeting in the West Bank city of Ramallah, Aug. 22, 2015. "The continued occupation and aggression against Christian and Muslim holy sites in east Jerusalem, particularly against al-Aqsa, opens the door to a religious conflict," Abbas said Wednesday. "We don't want it and we are warning over its consequences." 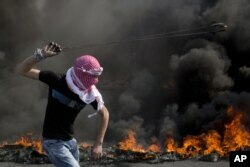 The violence appears to also stem from young Palestinians tired of the dim outlook for peace, little economic opportunity and Israeli settlements in lands they want for a future state. Netanyahu created controversy Wednesday when he said a former Palestinian leader, Haj Amin al-Husseini, talked Nazi dictator Adolf Hitler into slaughtering European Jews during World War II. U.S. Secretary of State John Kerry boards his plane to Germany at Joint Base Andrews, Md., Wednesday, Oct 21, 2015. "Hitler was responsible for the Final Solution to exterminate six million Jews," Netanyahu said. "It is equally absurd to ignore the role played by the mufti, Haj Amin al-Husseini, a war criminal," Netanyahu said. Historians have long-disputed this claim and said Husseini, while pro-Nazi, had only modest influence with Hitler. Later, Netanyahu said he had no intention of absolving Hitler of responsibility for "his diabolical destruction of European Jewry." VOA's Mike Richman contributed to this story from Washington.